Complementing our awesome 1 piece, 2mm, reversible camo suit, we also offer an optional reversible hood (blue camo one side and green camo the other). Great for colder days, this 2mm ergonomic fitting hood comfortably conforms to your head and securely tucks inside your suit. 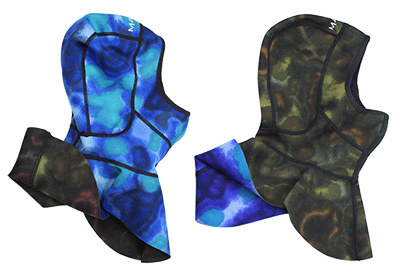 These hoods are not made using Yamamoto neoprene, nor are they made by our Yamamoto approved factory. Making these hoods is not easy. So, I had to use another factory which specializes in making these types of hoods. Although not made from Yamamoto neoprene, they are good quality hoods. I would not offer them to my friends or to my customers unless I was confident they would be well received. I (MAKO Spearguns) will stand behind this product the same way I stand behind all of our products. Available in S, M and Large, X-large. I bought this to add just a little warmth for diving in S. Florida. I use it with a 3/2 wetsuit. Truthfully, this thickness hood is going to add just a bit of warmth, but hoods always help. As always with MAKO I've been 100% satisfied with the purchase of this Hood. Fits well and works great. I always check with MAKO first for any purchase. Very happy with the hood and the service that I received.